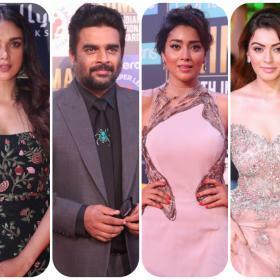 Rana Daggubati, Shruti Haasan, Tamannaah Bhatia and Taapsee Pannu gave paparazzi a busy day on Sunday. The stars were spotted at the Mumbai airport, making their way to respective places. Rana Daggubati, who was in Mumbai for a magazine cover shoot, left for the South city. The Baahubali star made a casual airport appearance and was all smiles for the shutterbugs. Shruti Haasan, who was heading to Chennai was clicked wearing a blue denim mini dress paired with a grey floral jacket. On the other hand, Taapsee Pannu made a very casual airport appearance in chequered shirt paired with denim. Tamannaah Bhatia made a very cute airport appearance in a teddy bear print dress paired with white shoes. The actress was all smiles for the shutterbugs as she made her way inside the airport.